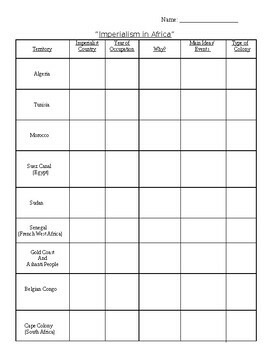 The following is a graphic organizer (in the form of a chart) which allows students to categorize Imperialism of Africa by European powers. The chart focuses on the African lands of Algeria, Tunisia, Morocco, the Suez Canal in Egypt, Sudan, Senegal, the Gold Coast, the Congo, and Cape Colony/South Africa). 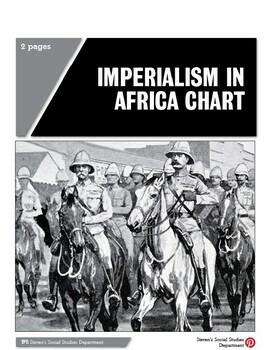 For each African territory, students are asked to identify and label the Imperialist Nation, Year of Occupation, Reasons Why, Main Ideas/Events Summary, and the Type of Colony the territory became. This graphic organizer comes with a key for the teacher to use and this assignment can be edited as needed.